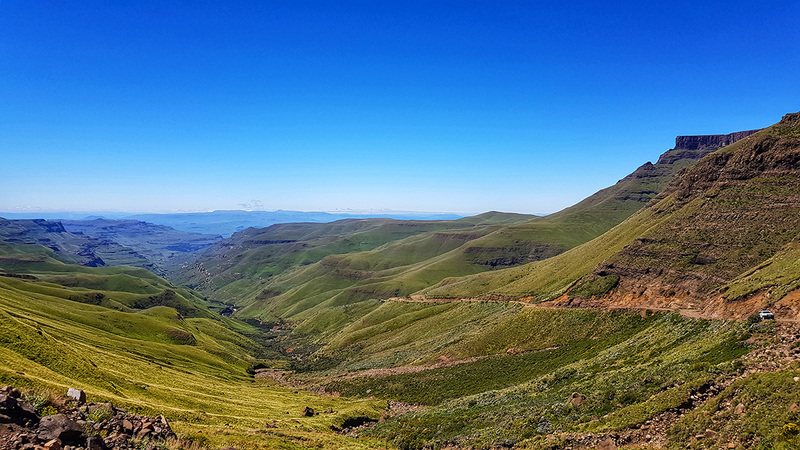 Sani Pass is one of the most talked about gravel passes in Southern Africa. It is the “Child of Fire” and for a long time, was the highest, longest and therefore most prestigious pass within our borders. Internationally acclaimed, adventure seekers come from all over the world to face this giant, usually in the form of guided tours in rented 4×4 vehicles. 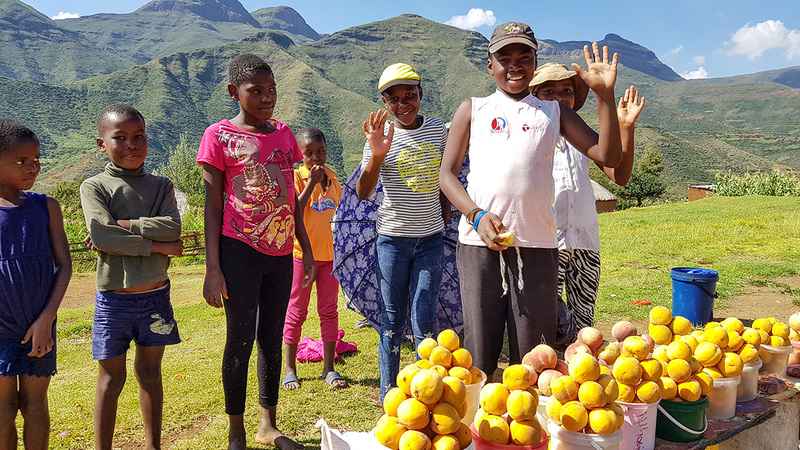 Statistically, Sani is just shy of 2 880 meters above sea level. It has an average gradient of 1:20, which is quite impressive for such a long pass. This means that for every 20 metres travelled, the vertical climb amounts to 1 metre. However, at places the gradient can be as steep as 1:5. Located in the Drakensberg region with closest towns being Himeville and Underberg, KwaZulu Natal. A very interesting, often argued fact is that Sani belongs to the Republic of South Africa. 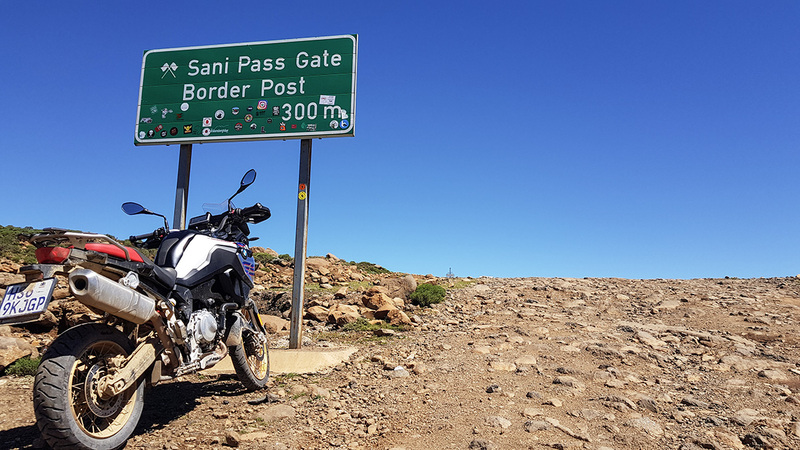 Although the RSA border post is roughly 8 km from the summit, it is not the official border. The border is defined right at the summit, at the welcome sight of the Lesotho border post. Reaching the top of Sani always brings a sense of relief, gratitude and joy! Up to the RSA border post, the going is scenic, although relatively easy. This facility is well kept and proper. The staff are very friendly and it has never taken me more than a few minutes to conclude formalities. Furthermore the border officials are not fussy about what kind or size of motorcycle is passed through, but be advised if you have a backup vehicle in your touring party, it will have to be a 4×4 specimen. Normal vehicles are not allowed beyond this point. Sani “proper” starts after passing the SA Border control. The final 8 kilometers to the summit is where you will realise that you have moved into the action zone. Undulating and twisty, describes Sani best. The surface conditions can change dramatically, according to the season. I have not been lucky enough to traverse this section in the snow, but can imagine it must be quite eventful. At the time of writing this article, the rainy season is just about concluded and has left the surface in a sorry state. The gravel has been washed out, which has left only loose rocks behind. I have never encountered it this bad before and inexperienced travellers must take note that they will traverse against my advice. In actual fact, the most notorious part of this journey is usually the final 14 corners of consequence, often referred to as “switchbacks”. This time, however I found the valley floor most challenging due to the state of the surface as mentioned before. The comforting part is that the final switchbacks, although overwhelming in size and gradient, are easily traversed due to recent maintenance. Take a deep breath and do the switchbacks in one go. It is difficult and even hazardous to stop during this part. Once you have stopped, it will take quite a fair level of skill to get going again. 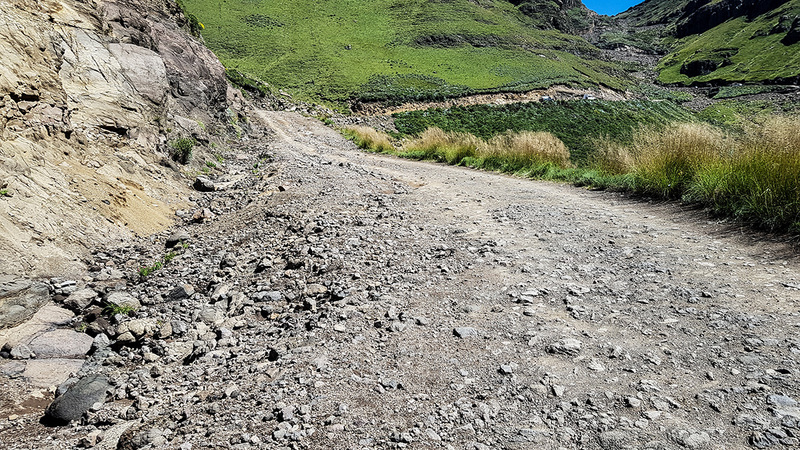 One thing that must be understood about mountain passes in general and especially so in Southern Africa, is that conditions change all the time and they can change rapidly. The wind near the summit of Sani can sometimes be quite treacherous. 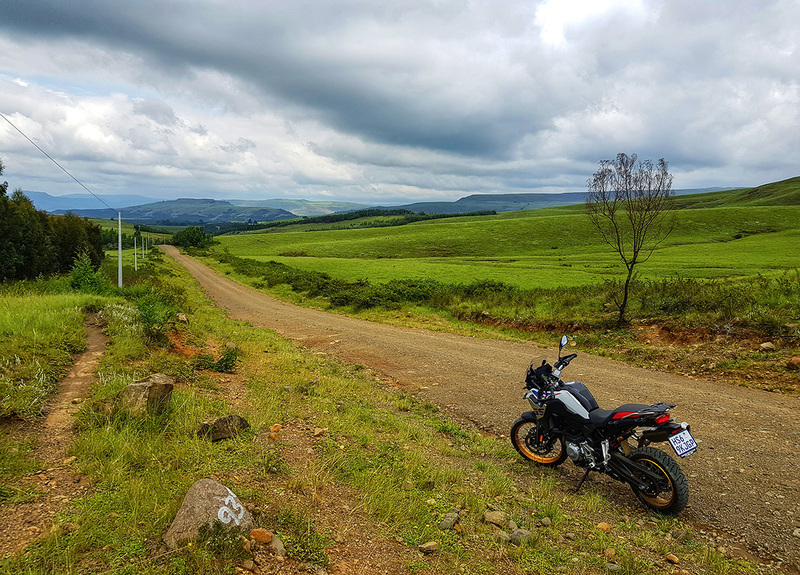 On a previous ride up Sani, my very experienced travelling buddy had his big adventure bike blown over by the wind, while stopping to take a picture. It is recommended that you travel with decent weather wear, as there can be heavy snow on the caps, while the sun shines in the valley. Taking pictures is something you will want to do almost all the time, if like me, you are a nature lover. The majestic sights, especially in the green of summer is hard to describe. I have not seen a single picture of Sani that truly justifies the actual beauty on offer. 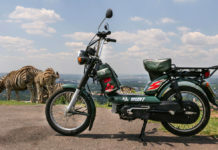 There are two kinds of adventure bike riders in South Africa, those who have completed Sani successfully and those who still harbour the desire to do so. For the adventure bike community, this serves a purpose. Sani Pass becomes the gauge by which all riders are measured. As tour leader and riding coach, I always find it helpful when a prospective client discusses their Sani experience with me. It usually gives me a good idea about their riding ability, but more importantly, their state of mind. I set off on Friday 8 March for a planned two night stay over in the area. 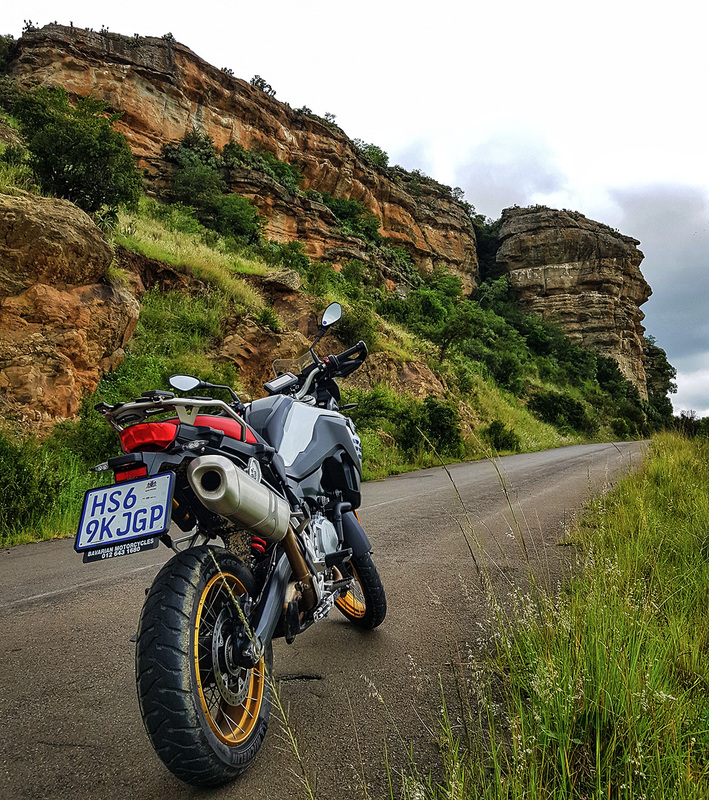 I wanted to do a follow up test on the BMW F850GS at the same time, as the conditions experienced at the media launch in November last year in Cape Town did not include this kind of challenge. A quick phone call to the friendly and ever helpful staff at Bavarian Motorcycles in Centurion and I was even given my colour of choice to maximize photo opportunities. It must be mentioned that over the years, this specific dealer has done more than any other for adventure biking in South Africa. 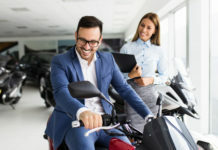 Their passion and knowledge is tangible and the dealer principal even offered to accompany me on my ride. Unfortunately, the date clashed with important commitments in his business calendar, so it was to be a customary solo ride for me. I was eager to report back on the current state of affairs, after an absence from Sani of more than a year. 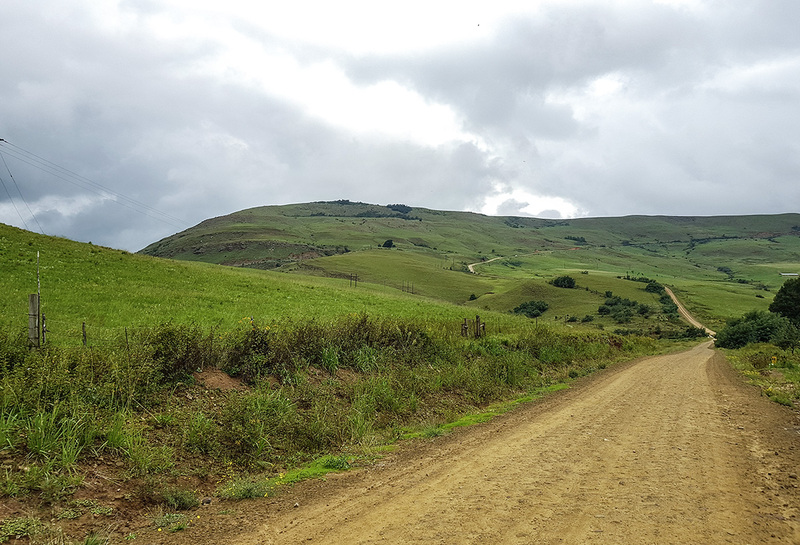 Traversing from Gauteng, I always plan my trip to include the Loteni Valley in KZN. Travelling to Harrismith on the N3 is always relatively uneventful. Just watch out for speed traps. The cruise control on the well equipped F850GS was a big help in this regard. From Harrismith I headed past the Sterkfontein Dam, over Oliviershoek Pass, down to Bergville. From Bergville, the next stop is Winterton. In Winterton you turn right on the R600 towards Estcourt. On the way to Estcourt, you will see the town of Draycott. Here I turned right into the town. Continue straight through town and it will eventually become the most beautiful gravel road. From here on, it branches into various lesser travelled tracks that eventually leads into the Loteni Valley, Lower Loteni and ultimately, the friendly town of Himeville. Himeville is a charming place with a rich history and various points of interest. 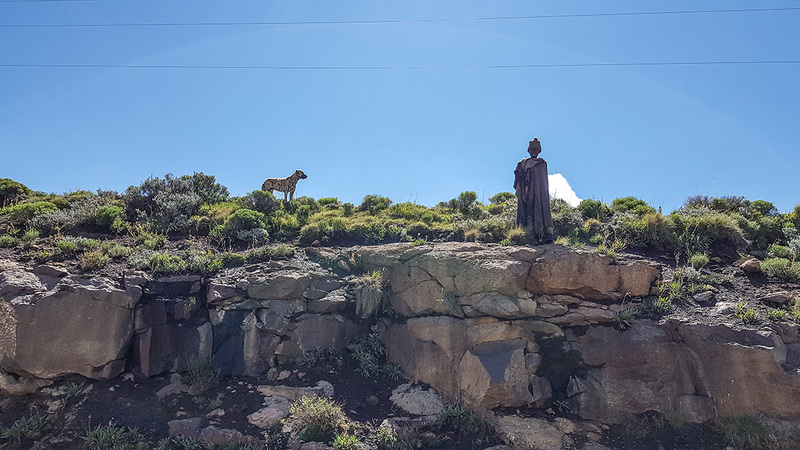 Named in 1902 after Sir Albert Henry Hime, Prime minister of Natal, it is also the closest town to Sani Pass, so becomes more like a pilgrims’ destination for adventure bikers. There is ample lodging on offer and one can take your pick. Be sure to visit the Himeville Arms if you happen to pass through on a Saturday, watching the customary rugby game with beer in hand in the cheerful pub. In the Lower Loteni Valley, I encountered fairly heavy rains, for which I was most grateful. I have heard conflicting reports about the surface when wet and wanted to make up my own mind. I was pleasantly surprised at the off road performance offered by the F850GS at brisk pace. The bike was fitted with the OEM Michelin Anakee 3 tyres, that favour road biased performance at best. Yet, I can safely say that the wet gravel surface offered good grip, even while turned to mud. 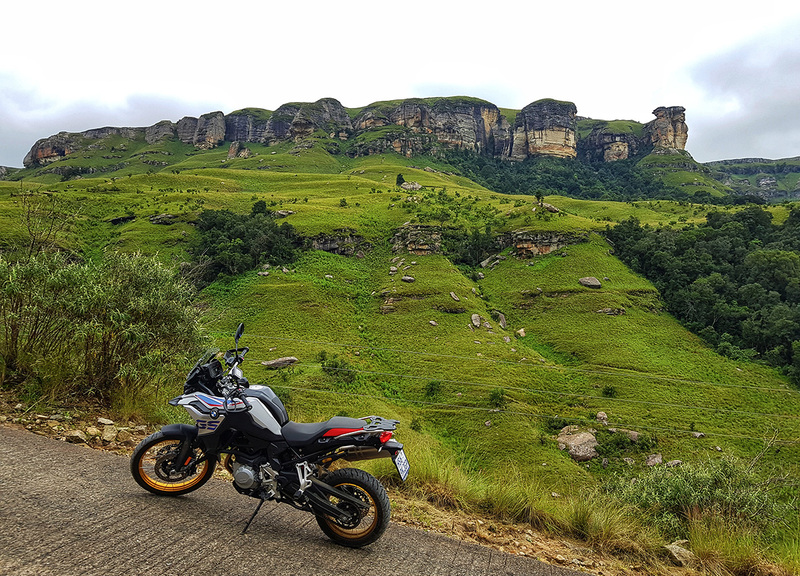 It was on Sani Pass that the F850GS was to get a proper test on the suspension side. I found the front suspension too soft for my type of riding. I prefer to keep good momentum in rocky conditions with a neutral, crouched riding position and “soft” hands. At this kind of pace, the rear end held up much better than the front end. I am convinced that a simple fix like thicker fork oil will alleviate this problem. The parallel twin motor, on the other hand was a pleasure to experience and was overshadowed only by the beautiful, understated exhaust note. I removed my ear plugs, just to listen while enjoying the flexibility of the power plant. I do not enjoy load exhausts and the standard arrangement on this bike was just perfect. 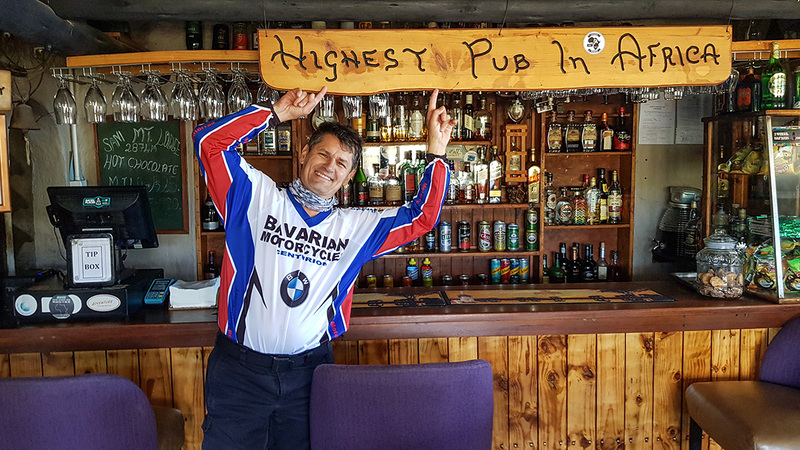 Getting to the top of Sani Pass, you just have to visit the “Highest Pub in Africa”, that forms part of the Sani Mountain Lodge. Experience 4 seasons in one day, as well as friendly staff and good food. You will get the opportunity to practice your Italian, German, French and just about any other language, as this is a popular tourist attraction. I have had only good times at this venue and although pricey by local standards, it is worth an overnight stay, especially in winter when temperatures can fall well below zero and the howling wind reminds you how privileged you are to simply be alive. In South Africa we don’t call it “asphalt”, or “paved”, we simply call it “tar”. This leaves us with the last, burning question. When will Sani be tarred? I do not know the official answer to this question and frankly, neither did any of the sources that I have spoken to in the last few years. I will offer my personal opinion and reasons for saying so. Ever since my first encounter with Sani in early 2015, I have seen signs of roadworks up to the SA Border Post. In my opinion, this is more basic maintenance than plans to tar. At best, we will see it tarred up to the SA border, but no further than that. Initial rumours was rife that the section mentioned would be completely tarred by as early as January of 2018. Until this day, there is no evidence of that. In my opinion, it will be very costly to tar the section from post to post, as there are some serious terrain challenges. Off course it can be done, but whether sufficient budget exists for such a fete, remains to be seen. An entire tourism industry is at stake and should Sani be tarred, it will lose much of its attraction and lure. Your ultimate reward after a refreshing stop at the “Highest Pub in Africa” is travelling through Lesotho itself. Although this is not the subject of this article, it must be mentioned that the paved roads is just from another world. Some call it the Alps of Africa, it is that good. I have included a few pics and descriptions about this must-visit place. In conclusion I am reminded why we ride. Some ride to see the beauty, some ride simply to relax. Then there are those who like to push the limits. 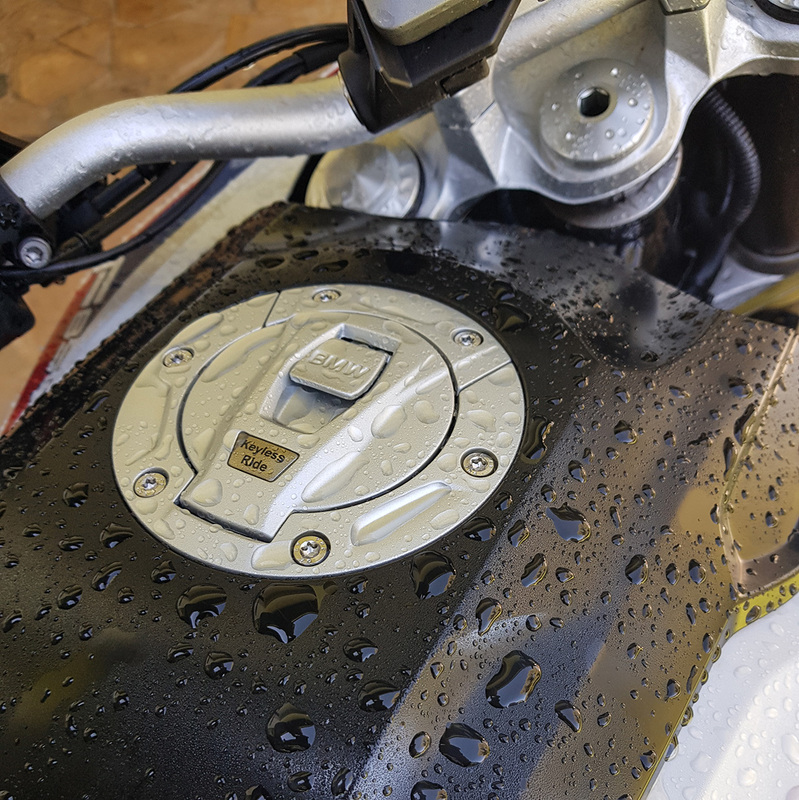 In any of the cases mentioned, Sani remains a must do for any adventure biker. Some will do it in one glorious swoop, others will do it like they eat an elephant… piece by piece. 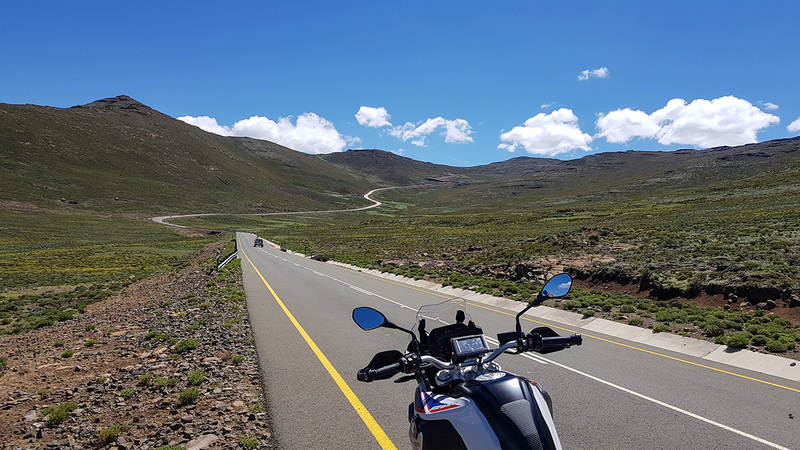 Either way, if you plan correctly and honestly evaluate your riding ability, level of fitness and experience then the elusive summit of Sani Pass will be well within your grasp.